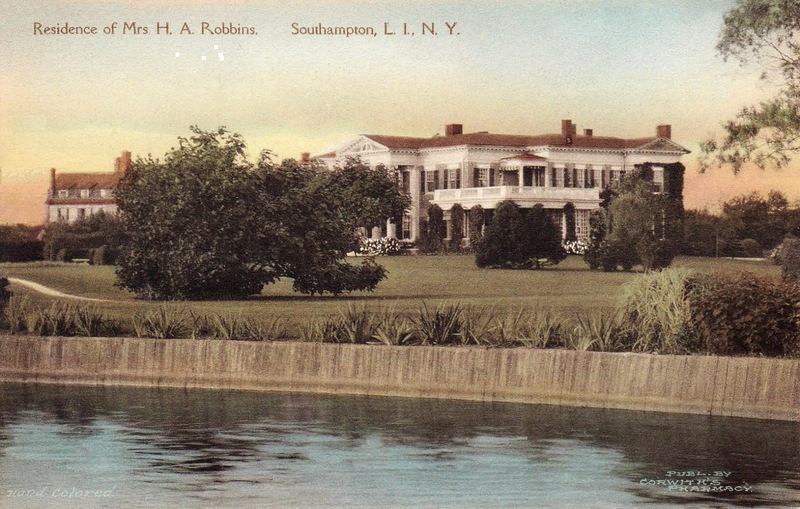 'Asher House', the Henry Asher Robbins estate built c. 1901 in Southampton. Click HERE and HERE for more on 'Asher House' which is no longer extant. Who was the architect? It has a lot in common with the big place Bard College owns up at Annandale. The Reynolds Metals Company was founded in 1919 as the U.S. Foil Company in Louisville, Kentucky by Richard S. Reynolds, Sr., a nephew of tobacco king R. J. Reynolds. Initially, the new company supplied lead and tin foil wrappers to cigarette and candy companies. In 1924, the U.S. Foil purchased the manufacturer of Eskimo Pies, which were wrapped in foil. In 1928, Reynolds purchased Robertshaw Thermostat, Fulton Sylphon, and part of Beechnut Foil, adding them to U.S. Foil to create Reynolds Metals. In 1931 the company headquarters was moved to New York City and in 1938 the headquarters was moved again to Richmond, Virginia. The company began producing aluminum foil for packaging in 1926. Reynolds Metals created the first high-speed, gravure-printed foil, aluminum bottle labels, heat-sealed foil bags for foods and foil-laminated building insulation paper. In 1940 Reynolds Metals began mining bauxite (aluminum ore) in Arkansas and opened its first aluminum plant near Sheffield, Alabama, the following year. In 1947, the company came up with its most famous creation, Reynolds Wrap Aluminum Foil. Meanwhile, Reynolds Metals pioneered the development of aluminum siding in 1945, and Richard S. Reynolds began predicting a growing demand for additional aluminum during peacetime. He knew it would not be long before new aluminum-producing facilities would need to be built to meet demand. Reynolds Metals Company leased, and later bought, six government defense plants that were up for disposal. Reynolds later expanded into non aluminum products such as plastics and precious metals, introducing Reynolds Plastic Wrap in 1982.